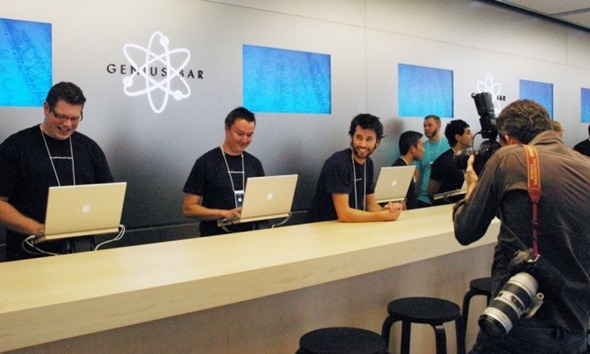 The Genius Bar, Apple’s iconic in-store help desk, is set to begin using the iPad 2 in place of the MacBook Pro. The Cupertino company’s take on the customer service experience is what makes walking into any of the many hundreds of worldwide outlets so unique. In each store, you will find that glass staircase (patented by none other than Steve Jobs himself), a lot of consumers caught up in the furore (how many times have you walked into an empty Apple Store? ), and of course, the Genius Bar, behind which you will find an array of finely assembled techies ready to help resolve your iQuibbles. Whether you want info on warranty, repairs history, parts, or have just spent too long in a call queue, the Bar and its occupants are, as reliably as taxes, on hand. Currently, the Geniuses (a lightly-used term nowadays it would seem) are immobilized to a degree by the MacBook Pro. Yes, it’s portable – a lot moreso than say, the Mac Pro. That said, it would make the whole ‘meeting a genius’ process a darn site more interactive if the Genius wasn’t stuck behind the screen. If only there was a device larger than, say, an iPhone, but just as portable. Anyone? Of course — the iPad! According to 9to5mac, Apple will begin using iPads in order to help customers in a move that is said to be far more productive and useful in getting things resolved. Geniuses can roam around the Store, and at the same time free up space over at the Bar for those with major repair issues as opposed to those who just need to restore via iTunes. The MBP takes up a significant amount more space than an iPad, so the move will effectively allow more Geniuses to be stationed, ready to help more customers and alleviate that claustrophobic scrum of Apple fans. In addition to the ease-of-communication, the iPad would also allow customers to sign signatures on iPads instead of printed paper. Apparently, everything will begin to come into effect as of next week, presumably starting in San Fran before working its way across the States and subsequently hitting the world stage thereafter. The only question that remains is, what took them so long?